Grace is most commonly defined as “undeserved love.” Mankind is corrupt through and through, because of the sin we inherited from Adam, and because of our willful acts of disobedience every day. But God showed his undeserved love toward us in Christ, when he punished him on the cross in our stead, and raised him to life on the third day. At the center of the logo, you will think you see a cross. In fact, it is the absence of a cross, reminding us that Jesus died for us and now lives for us. God’s grace was further shown when, despite our lost condition, he created faith in our hearts to believe in Jesus Christ. The Christian Church professes that God imparts this faith to us without human works. It is truly undeserved and unearned. The Bible teaches that grace comes to us through various tools, known as the “means of grace.” The three means of grace are the Word, Baptism, and the Lord’s Supper. These are the only places where God promises to be present with his Holy Spirit to create faith in our hearts. The logo takes the shape of a chalice, which represents the Lord’s Supper. The cross divides the chalice into four quadrants: the upper two form a book, which represents the Word of God (that is, the Bible). The red portion of the chalice represents the wine received in the Lord’s Supper, and the blue portion represents the water received at the font in Holy Baptism. The means of grace all center on Christ and his redemptive work on the cross. 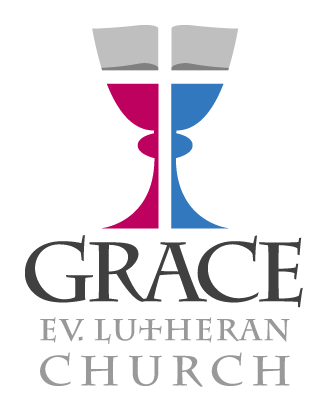 Grace Evangelical Lutheran Church holds Jesus to be the only means of salvation. We hold the Bible to be the true and inerrant Word of God, and the only way we can know about Jesus’ saving work. We hold the Sacraments of Baptism and the Lord’s Supper to be effecatious for the forgiveness of sins, and for both creating and strengthening faith. Through these means of grace, he makes us heirs of eternal life in heaven. This is what we believe, teach, and confess.